Heat oven to 350° F. Spread the pecans on a rimmed baking sheet and toast for 8 minutes. Let cool and roughly chop. With an electric mixer, beat the butter and 1 cup of the sugar until fluffy. Mix in the vanilla and almond extracts and salt. Gradually add the flour, mixing until just incorporated. Mix in the pecans. 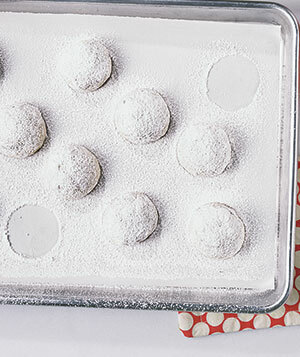 Shape the dough into tablespoon-size balls and place on a parchment-lined baking sheet. Transfer half the balls to a second parchment-lined baking sheet, spacing them 1 1/2 inches apart. Bake until lightly golden, 18 to 22 minutes. Let cool on the baking sheets for 10 minutes. Place 1/2 cup of the sugar in a large bowl. Toss the warm cookies in the sugar and return to the baking sheet. Sift the remaining 1/4 cup of sugar over the cookies before serving.